AZEK® Cornerboards provide protection from air and water infiltration and add great curb appeal. 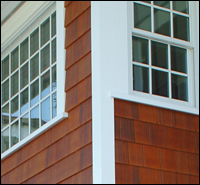 They also protect siding edges, particularly when the rabbeted Cornerboard version is used. AZEK® Cornerboards are perfect for ground contact applications because AZEK® is impervious to moisture and insects. Installing AZEK® Cornerboards is fast and easy because a true 90 degree corner is already formed. They don't need painting, but because Cellular PVC does not absorb moisture, paint lasts much longer if you do want to paint it. They are covered by a AZEK's 25-year Limited Warranty. Cornerboards are available with square or rabbeted outer edges, as shown here. Both are available in Traditional or Frontier finish and in 1" or 1-1/4" thick boards. 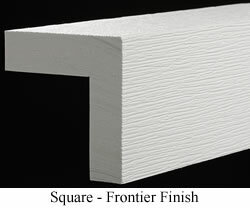 Photo at left shows Square-edged Cornerboard with Frontier finish. 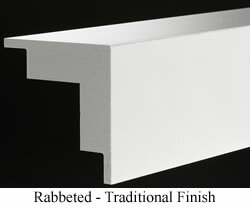 Photo on right has rabbeted edges and Traditional finish. Available in 10 foot and 20 foot lengths, but easily shortened using standard woodworking tools. We will custom cut your purchase to whatever lengths you wish at no additional charge. Need to hold this in your hands and see how well it works for your Corners? Order one or more 3" long Samples. Do you want us to cut to custom length? : Select one:NO, ship length(s) selected above.YES, I'll enter custom length(s) below.